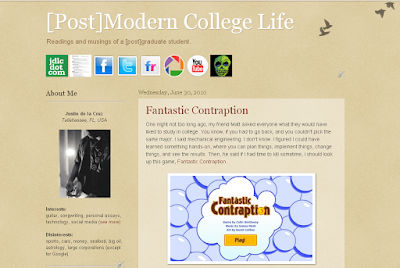 It's been a while since my last blog redesign. Yesterday, Jess was working on updating the template to her blog. I remembered Blogger releasing some new templates and a way to edit them better, but I hadn't checked it out. You all can tell by now that the blog has been updated (unless you're reading from Google Reader... woot), but I'm posting this for historical purposes, more or less. I guess. I don't know. I'm kind of bored. I know it's kind of corny, but the birds remind me a bit of Wilco's Sky Blue Sky. And that album inspired one of the last pieces I wrote for the FSView.